Daily Illuminator: This New GURPS Supplement Will Really Grab You! September 9, 2013: This New GURPS Supplement Will Really Grab You! 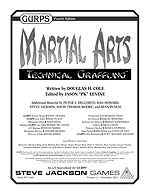 It's been a while since we had a new GURPS release, so we've decided to go with one that is best described as "gripping": GURPS Martial Arts: Technical Grappling. This supplement greatly expands the rules and possibilities of GURPS Martial Arts, with a detailed system that expands the possibilities for heroes disarming dangerous lawbreakers with their bare hands, warriors trained to fight to the death, wrestlers vying for supremacy in the ring, and more. Learn new and modified GURPS techniques to take full advantage of the options herein, and discover how to use a variety of weapons to restrict your opponents' movement and offensive capabilities. If you've been wrestling with which GURPS supplement to buy, we can think of no better possibility than one that deals with wrestling: GURPS Martial Arts: Technical Grappling. Available now, in the digital arena of e23!